BioV™ Clarity Stress / Anxiety Blend - Many of our pets today suffer from stress and various forms of anxiety as the result of poor quality, overprocessed pet foods that contain many chemicals and toxins. In addition. we give them toxic drugs and medications along with exposing them to environmental toxins daily. This alters the mineral, hormonal and biochemical balance that manifests itself in fear biting, separation issues, inappropriate behavior and other disorders. The botanicals used here help to detoxify and remineralize to balance these conditions. 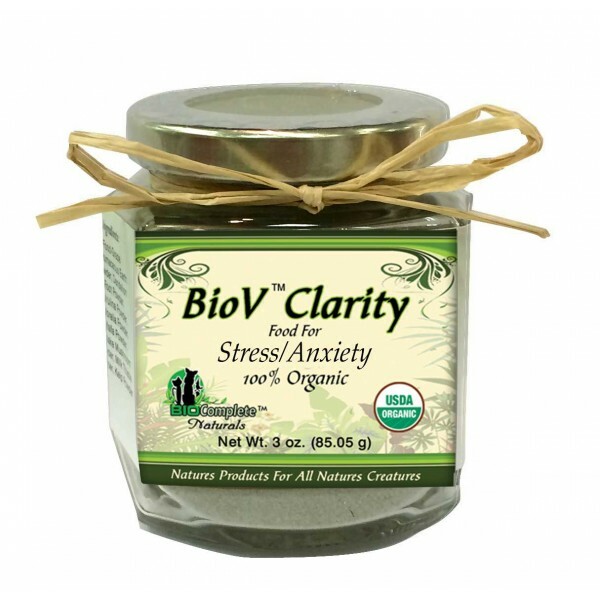 Use with any stressed situation including storms, hurricanes, vet visits, car trips, traveling or moving. A core of all BioV™ Clarity Blends is the cleansing and maintaining of the filters of the body, the liver, kidney and lymphatic system. When these are functioning properly, there is far less stress on the body as a whole. As a food, there is no standard dosage but realize these are micronutrients. As such start with same amounts of ½ tsp per day and adjust. Ingredients - A proprietary blend of: Valerian Root, Dandelion, Milk Thistle, Echinacea, Licorice Root, Slippery Elm, Chamomile, Bilberry, Lavender, Catnip Powder, & Diatomaceous Earth Powder (food grade).